Tickle your funny bone with these spooky silly Novelty SKELETON DRINK STRAWS! 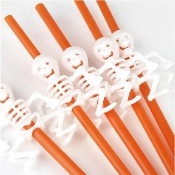 Big 3-inch white plastic novelty skeletons dangle on 11-inch long Orange drink straws will tickle your funny bone! Features jointed arms and legs. Ghoulish gothic pirate themed birthday party favors, prizes and decorations. A fun way to sip Halloween witch’s brew, too. *Craft-minded afficianados have also used these as craft supplies to attach to regular twinkle lights. Create your own custom Halloween and gothic themed light strands! The straw holes in their heads are just the right size to insert individual twinkle lights from Christmas lights strings. (*Of course, you must attach their severed bottoms to the torsos with twist ties or wire) The lights glow through their hollow heads and open bony ribcage bodies! *Other fun uses include car antenna applications… Just be sure to top off with some type of stopper to prevent flying off in the wind! Or add to your lawn flamingo legs for added holiday fun! Orange soft plastic fat-style straws, approx. 11-inch (27.5cm) long. White durable hard plastic skeletons, approx. 3.25 (8.13cm) inch tall, with top and bottom pushed together. 2-inch (5cm) across at widest point. *Decoration only. NOT a toy. Includes one SET of Five (5) Straws.